The discussion of green cities has been increasingly gaining importance and becoming more and more relevant in a world where sustainability is at stake. Cities are now ranked and considered for their green spaces and sustainable options. Administrations are progressively shifting from a factory-oriented,work and production related mentality to an environmentally-friendly mindset. A notable example can be found in the seal of the city of Syracuse, New York: the old symbol, representing an industrial plant with smoking chimneys, was replaced in the late Eighties with a stylized depiction of the skyline. Cities don’t want to be associated with factories, chimneys and smoke anymore, as they strive to not be recognized exclusively as work places but as multi-functional metropolises, full of opportunities, and where sustainability has a prominent role. But, where in the West this change in mentality has already occurred, rapidly-expanding urban areas in Asia have seen a reduction in green spaces over the past few decades. City administrators have felt there was no choice but to fell trees, close parks and basically fill any otherwise free space with condos and infrastructure, in an effort to make room for the mass of new urban migrants. During the Industrial Revolution, for European and American cities, attracting low-cost, mobile labor was vital. In their current states of rapid development, most Asian cities have no need to compete for labor and urban planning is generally a low priority. Although the process of finding the space to accommodate everyone is crucial for Asian metropolises, the need for green, urban spaces and more importantly, sustainable development, are even more significant for their futures. Bangkok is no exception and has pushed green projects further up on its agenda. In fact, the Bangkok Metropolitan Administration has planned and constructed a number of city parks over the last few years. To keep pace with its goal of nine square meters per inhabitant, the metropolis needs to increase its green space per capita. Currently, just six square meters of Bangkok per inhabitant is green space and only Hanoi scores lower within ASEAN. There are several advantages of building city parks: there are increases in the inhabitants, quality of life, safety perception, property values and neighborhood happiness. City parks are not the only way to bring green to Bangkok, though. The capital has become a web of very wide, hot, concrete roads, often running below an upper level of expressway, flyover or elevated rail. The extremely narrow sidewalks are rarely home to trees or other greenery, nor is there a boulevard-like separation of roadway and walkway, as in western cities. To address this deficiency, the BMA has initiated a project called “Bangkok Green Network“, intended to transform the Thai capital into a green city through the planting of trees along urban roads. The project will use the central, yet residential Sathorn Road area as a pilot study. The goal is to turn Sathorn Canal into a shaded recreational space, creating a walkway and a bicycle lane eventually connecting Sathorn, Lumphini Park and Benchasiri Park. If the pilot succeeds, a web of shaded pathways promoting soft mobility as a daily means of transport, would stretch throughout the city. Bangkokians themselves understand the importance of having green areas in and around the city center, and many long to enjoy fresh air without having to join the weekly exodus to the provinces. This desire is demonstrated by the strong draw of Bangkok’s green resources: around 15,000 people go to Lumphini Park to run, jog, walk or just to experience Bangkok’s own Central Park-like views; Bang Kachao, a 20 km piece of conservation land in a southern bend of the Chao Phraya River, often labelled as Bangkok’s lungs, is chosen by many citizens as a bike-riding destination during weekends. 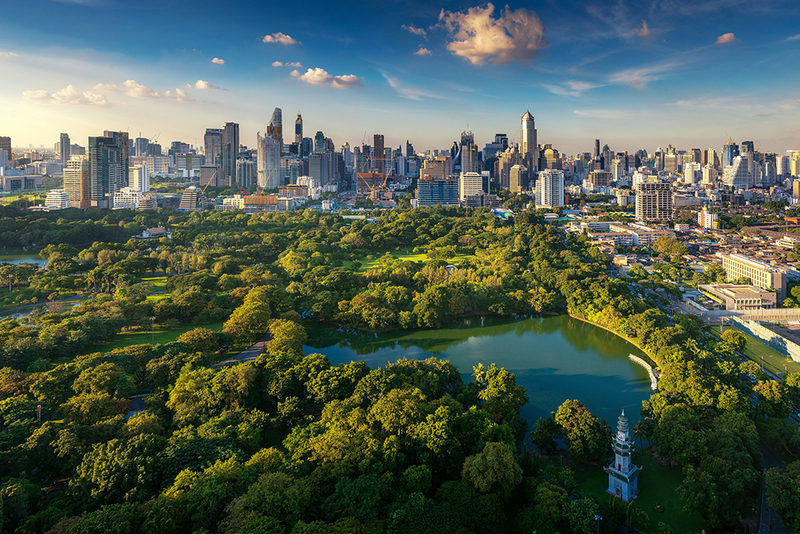 As the demand for green spaces increases and the trend is sure to continue- Bangkok’s attractiveness will be more and more tied to its green spaces. As there is still a lot of ground for improvement, City Hall is open to new ideas and investment opportunities abound.